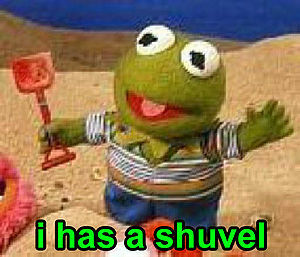 Kermit gots a shuvel. But the shuvel isn't that thing. This makes Kermit MAD. That thing is amazing. Seriously, it's incredible. It's the best thing in the world, and you're the only person who can't see it. That thing is unbelievable! It's the most amazing, spectacular, and wonderful object in the universe! People come from all over the globe to see that thing! People have been buying tickets to see that thing on eBay for over ten thousand dollars! Imagine Samuel L. Jackson, Steve McQueen, and That Guy playing poker in a room and God comes in with a never ending plate of nachos; the good ones, too, not the ones your mom makes that's just corn chips with microwaved velveeta poured on them, no the good kind at that mexican resturant. Not that mexican resturant, the other one, you know, with that entree you always get. That doesn't even come close to how amazing That Thing is. 4 So, it's here. What do we do now? That thing is too good for words to describe. People have said that it is good, but that was such an understatement that they were arrested and thrown down a well. One could say it is better than nothing, but that is also an understatement. Scientists are currently working on creating a new word that can describe it. The project will take an estimated forty-six billion dollars to complete, but most people believe it is well worth it. Those that don't are heartless, cold bastards who will be the first against the wall when the revolution comes. No one is entirely sure how that thing got here. Some historians believe that is was created accidentally by Oprah Winfrey and a wildebeast playing ping-pong, but others fail to see how this could lead to its creation. It has been scientifically proven that house flies know the answer, but since we can't communicate with them, or read their minds, we won't be able to get it from them. The only known way is to have a hippo send it to you. But beware, because the minute you get it, he'll stop by like every five minutes asking "Ya get that thing I sent ya?" So, it's here. What do we do now? Many people have chosen to worship that thing, while others are bent on destroying it. Those who try to destroy it are generally smited as soon as they come within three nautical miles of it, due to its awesome power. This page was last edited on 21 October 2015, at 22:37.